Our collection of studies is published for the 50th anniversary of the foundation of Transdanubian Research Institute. However, we are not going to give a summary on the results and failures of the past 50 years. Instead of looking back to the past we are going to analyze the recent changes of the Hungarian society, politics, public administration and regional structures. In Hungary changes in the economic and political system started and they still take place in a very peculiar situation. Even the sharpest critics of the past era must admit that these changes are originated from 1968, the year of the establishment of market conditions in the socialist economic system. This gave a possibility for the development of new tendencies that were different from the original intentions of the political elite not only in the field of economy, but in private social sphere as well. The first three papers dealing with changes in Hungary's economic, political and constitutional structure (ILLÉS, I., BOHM, A., ÁDÁM, A.) give a comprehensive analysis on the complex interrelations of the whole transformation process that became more intensive from 1988. During the changes that are taking place the old social, economic, political and constitutional system should be terminated, the country's functional integrity should be preserved and the foundations of a modern civil society and a multiparty parliamentary democracy with the institutional system of market economy should be laid down at the same time. The trouble is that all these tasks should be carried out simultaneously, for the lack of any components may cause a serious breakdown in social development. For the systemic solution of these problems Hungarian practice relies on the old traditions of the period before 1945 and on the experiences of modern European societies. Papers on "sectoral" problems (PÁLNÉ KOVÁCS, I., FODOR, I., BARTKE, I., ERDÖSI, F., LENGYEL, I., FORRAY, R. K., TÓTH, J., DÖVÉNYI, Z.) give a very detailed analysis on the situation. In most cases each paper's individual attitude to the problem differs from the other's. Thus it is natural that the reader will find differences in their final conclusion as well. The authors do not deal with all "sectoral" problems. For example there is no paper on agriculture. Agriculture in Hungary is undergoing the most peculiar transition. There are very rapid changes in its "legal background and regulation", property and working conditions are not clear and all these changes take place in a jungle of sharp political and interest conflicts where agricultural farmers cannat decide themselves what is right and what is wrong for them. 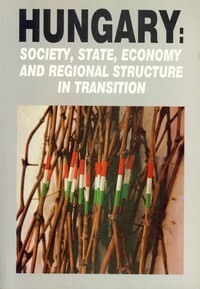 Papers analyzing the regionaI impacts and outcomes of system change and transition (ENYEDI, Gy., RECHNITZER, J., NEMES NAGY, J., HORVÁTH, Gy.) give a very clear and comprehensive analysis on macro-, mezo-, and microregional dimensions. During the process of economic restructuring some regions were devaluated while the quick expansion of the country's relations with Western European countries resulted in a higher appreciation of Western Hungarian towns and regions. The last paper in this collection (LACKÓ, L.) investigates the possibilities and problems of regional science and gives a summary of cases taken from foreign countries with the definition of the most important tasks for Hungarian researchers. We hope that our collection wíll give a clear and detailed analysis on the interrelationship and interdependence of the Hungarian economic, political, institutional system and regional processes. However this analysis cannot give a full and still less a "final" review on all details of the whole situation.